This is to inform my audience from Africa, Nigeria that, you can now carry out USSD transactions with all Nigerian banks from just one mobile app; the USSD banking app. This app gives you all the codes even without internet. The app is very easy to use and is designed for the young and the elderly who mostly forget things and has no time for internet services. 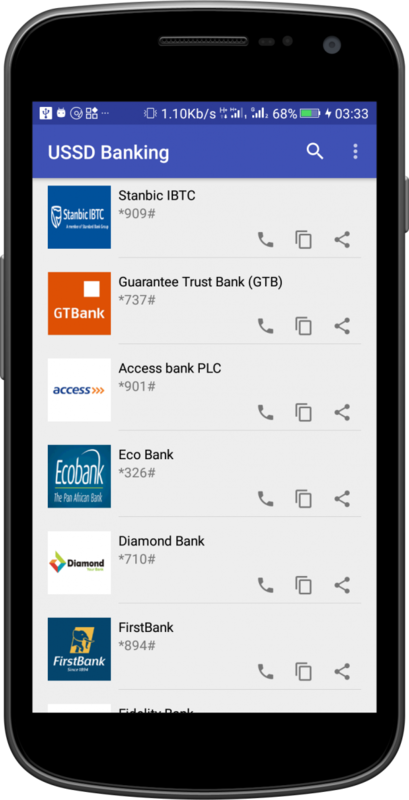 You can dial codes to buy airtime, transfer funds and other USSD services offered by your bank with just one tap from the app. Copy codes, share them with friends in a cool way! And a whole more! Dial USSD codes directly from the app. Copy codes to your clipboard in just one tap and paste anywhere. Share codes with friends and family with ease (Very helpful when a friend asks for code for any bank). Search feature to help you find your favorite bank faster. Transfer funds from your account to others with just one tap. Buy mobile recharge for yourself or send airtime to friends and family directly from the app. All that and more for free and without internet or remembering codes for different banks. download App from Google Play store now !! !